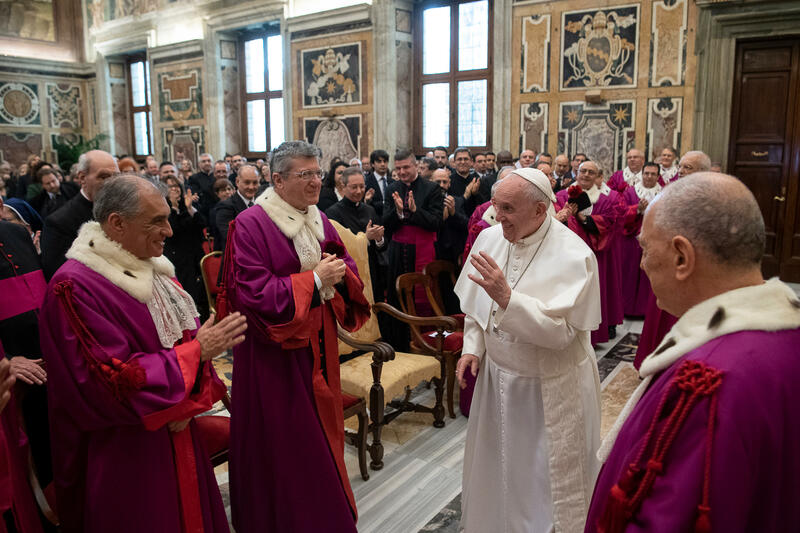 Pope Francis made this point in his address to prelate auditors, officials, lawyers and collaborators of the Tribunal of the Roman Rota, on the occasion of the solemn inauguration of the judicial year, when receiving them in the Vatican today, Jan. 29, 2019. In the daily ministry in the service of Christian marriage, Francis reminded them that they have the experience of two fundamental cornerstones, not only of theology and canon law of marriage, but also and first of all of the very essence of Christ’s Church: unity and fidelity. So as to be validly contracted, marriage requires of each of the betrothed a full unity and harmony with the other, so that, through the mutual exchange of their respective human, moral and spiritual riches – almost by way of communicating vessels – the two spouses become a single entity. Unity and fidelity are two important and necessary values not only among spouses, but in general in interpersonal and social relations. These two assets, “indispensable and constitutive of marriage,” Francis reasoned, “must not only be adequately illustrated to future spouses, but also demand the pastoral action of the Church,” especially of bishops and priests, to accompany the family in the different phases of its formation and of its development. Such pastoral action naturally cannot be limited to the completion of paperwork, he said. This is the news, he said, that “should render stronger and comforting even the ministry of bishops and priests, faithful and full of love,” just as the love and conjugal faithfulness of the spouses Aquila and Priscilla were of comfort to Paul and Apollo. Pope Francis concluded, thanking them for their work, imparting his Apostolic Blessing, and reminding them to pray for him.